Can you imagine spending a weekend with people that share a common interest? Do you have a desire to learn more about hemp building? Would you like to be involved in a team building activity working to create a remarkable, sustainable structure? We are creating more of these experiences for 2017 and you can become part of our global team of hemp entrepreneurs. ​"John, and I talk about you all the time too. The hempcrete block we made at the Hempcrete Workshop has been everywhere with us and is always talked about. We just had it with us in the Rayburn building in Washington D.C. and like always, people ask about it and it really piques their curiosity. It's about tied with the hemp skateboard that Geoff Whaling had made. The class you taught here in Pennsylvania got great press and it was a piece of the puzzle that we collectively put together to make the case for hemp. Can't thank you enough. Your work is much appreciated." In this educational, entertaining and enlightening speech John transforms his audience into true Hempsters. This workshop is designed to engage participants in the industrial hemp Movement and get them on board in aiding local or worldwide efforts to build healthy and save our planet. Hempcrete Building Workshop- $6500 usd. up to 25 people. Our flagship program designed to show participants all aspects of building with hemp including mixing techniques, shuttering or slip forming, material sourcing, hemp walls, floors and roofs, framing a hemp structure, interior and exterior plastering and more. 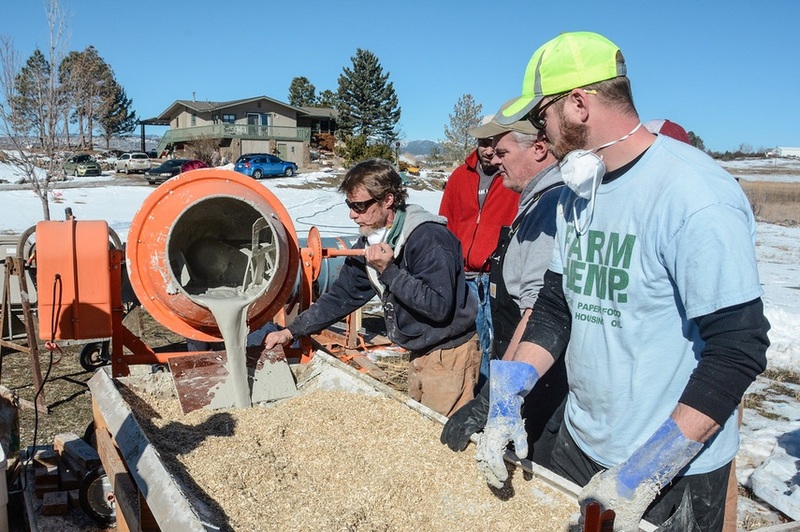 .Hands-on Hempcrete Fun- $2200 usd. up to 40 people. Learn basic recipes and mixing techniques as well as information on how and why to get into the hemp building industry. You will get to take home what you make. Either a hemp ball or a hemp brick. Tiny House Framing Workshop- $6500 usd. up to 20 people. Hands on framing of an actual tiny house to get it ready to apply hempcrete to the walls, floors and ceiling. Learn a simple building system that saves on labor and materials. Learn to build a 10 x 12 structure which will teach you to build any size building of your choice. If you'd like to book John for your hemp conference or seminar, or to organize any of John's workshops, give him a call at +1 970-231-0933, or fill in and return the form below.